Get ready folks, because come 2015, you will be the proud owner of brand spanking new My Number (マイナンバー) issued by the friendly folks at the Japanese Government. On May 24th, the three major parties in the National Diet finally got off their duffs and managed to put together a brand new law that gives everyone residing in Japan (foreigners included) a single unified identification number akin to a US Social Security number. The so-called mai nannbaa-ho (マイナンバー法), or "My Number Act" (officially called the shakai hosho zei bango-ho 社会保障・税番号法 or "Social Benefits and Tax Number Act") will have far reaching effects on just about everyone who uses a government service (i.e. the whole country). Lets take a peek at what the law entails. Unlike many Western nations, Japan lacks a true individual identification number that stays with you from cradle to grave. Instead, authorities rely on the Family Register System (for Japanese nationals), the Basic Resident Registry System (for Japanese and Foreigners), and the accompanying Basic Resident Register Card. All of these systems have their own individual numbers plus separate numbering systems for national tax payment, local tax payment, health insurance, and pension. To make matters more complex, foreigners have their own Resident Card number. As each systems has its own set of numbers and rules, each requires a section of bureaucrats to administer. Also, many services are administered at a local level, putting a great burden on towns and prefectures. The new 16-digit individual number (kojin bango 個人番号) (AKA "My Number") will help simplify all public services into one unified filing and record keeping system and allow municipalities to theoretically stream line administration and cut down on the number of civil servants. The new system will officially cover health insurance, nursing care insurance, pension, tax records, and welfare benefits by combining them all into one handy card with one fixed number. The goal of this new system is to not only streamline various administrative tasks but also catch tax cheats, find welfare and pension scofflaws, and even to make medical record keeping easier. The government also plans to introduce a "My Portal" web page where residents can log on and easily access information related to public benefits. Details on how numbers will be assigned as what organisation will be running the whole system are still vague. However, the law does call for non-governmental third party auditors and observers to make sure the system is run fairly and privacy rights are not violated. There is a good bet that the Ministry of Internal Affairs and Communications and the Local Authorities System Development Center (two organisations that run the current Basic Resident Register Card network) will be somehow involved. Seeing as how the non-compulsory Basic Resident Register Card has failed to catch on (less 5 percent of the population has one), the My Number system will likely supersede the Basic Resident Register Card once fully implemented. Government agencies are already hard at work creating a unified record keeping system and drafting the necessary ministerial ordinances necessary for the law to take effect. Localities and prefectures will also join in to determine how the numbers will be divide up and how to make changes to their own record systems. The law calls for the first "My Number Notifications" (mai nanbaa tsuchi-hyo マイナンバー通知表) to be sent out in 2015 with yet-to-be-named "My Number cards" set to be sent out around 2015-2016. The date for full implementation on the system is 2016 and the government is looking to expand usage beyond tax, benefits, and medical services by 2017. And for all you civil libertarians out there, yes this system is mandatory and you cannot opt out. You will get a number like it or not, however carrying the card at all times is not compulsory. The current plan calls for paper cards to be issued with the option of exchanging it for a regular plastic IC card complete with photo, birth date, etc. It is not yet clear if number cards will include biometric data other than a photo. 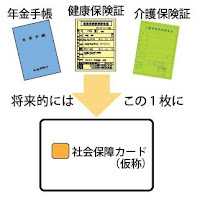 At of the time of writing this article, foreigners will be included in the new system but it does not appear to abolish the Residence Card (zairyu kaado 在留カード) that must be carried by mid to long term residents at all time. However, the immigration systems and My Numbers systems will likely be linked by the time the system is made public. No more booklets and cards- The My Number Card will theoretically get rid of pension books (nenkin techo 年金手帳), individual health insurance cards/booklets, nursing care insurance cards, unemployment insurance cards, and so on. These currently all have their own numbering system and you must present them when applying for benefits. Basically, a lot less vital paperwork to lose. Unified filing and procedures- Rather than having to find the necessary documents, look up where to submit it, and what paper work to file, the My Number system allows a government clerk to look up all your benefits and details in one convenient file. Easy tax filing- Your pension, welfare, and income records are all connected in addition to local and national tax filing. In addition, My Number can be used to access e-filing systems and simplifying proof of income for deductions. Simplified credit check- Since Japan lacks a unified ID number, checking bank databases for credit worthiness can be a time consuming hassle. However, now financial institutions can use your number (with your permission of course) to check your financial history when applying for a line of credit. Prior to this, credit records required enquiries across multiple municipalities and lots of paper records to be submitted by the applicant. Medical insurance- Although insurance benefits, payments, and reimbursements are generally standardised across all types of public medical insurance, record keeping is not. If you change municipalities chances are you will have to get a new insurance card/booklet. Also, moving between insurance schemes (i.e. moving from work provided insurance to National Health Insurance) requires a lot of paper work. The My Number card aims to simplify this by combining your insurance into one card with one number that can be easily referenced regardless of what system you belong to. 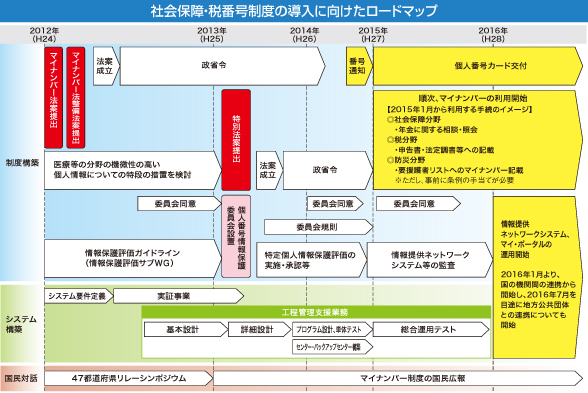 High co-payment simplification- All public health insurance schemes have an annual maximum out-of-pocket expenditure cap known as kogaku iryo-hi seido (高額医療費制度) based on the cost of the procedure, total co payment, your income bracket, and age. If you find yourself going to multiple specialists or hospitals, keeping track of how much to pay and knowing when and where to apply for this discount can be a real hassle. However, the My Number system makes it easy for insurance groups and doctors to track monthly medical expenditures and adjust premiums accordingly as to avoid over payment. Medical record keeping- Since My Number will be integrated into the insurance system, it will be easier to keep track of patient records. Currently, every insurance provider uses a different numbering system which means that doctors cannot use insurance identifiers as a means of record sorting. With My Number, doctors can easily check on what insurance organisation you use by referencing a single number as well as using this number to keep digital records which can be shared between doctors, specialists, and pharmacists. Cracking Down on Benefit Fraud and Tax Evasion- The lack of a single identifying number has proven to be a problem for prefectures and municipalities looking to crack down on fraudulent welfare filings, illegal pension collection (usually from long deceased family members), and people failing to report multiple sources of income. It will also make it easier to chase down local tax cheats who constantly change residences. Privacy- Of course, with the centralisation of information comes the inevitable creeping feeling that The Man is watching your every move. This is made even worse by the fact that data will likely be stored in a central and/or shared database that is vulnerable to hackers. Of course, Japan has some of the world's most stringent privacy laws, but that has not stopped hackers, criminals, and generally lazy public employees from making a mess of things. Taxes and Bills- I have known plenty of foreigners who goof around in Japan for a year or two, ignoring local residence taxes (juminzei 住民税), pension payments, and so on only to leave the country with bunches of unpaid bills. Since My Number acts as a centralised tax number as well as being linked to your immigration information, there is a good chance that your tax cheating friends may find themselves stuck with a bill at the airport. Depending on privacy measures, private companies like mobile phone providers may also be able to catch delinquent bill payers as well and file criminal or civil complaints. Information Sharing- Depending the the privacy laws and measure put into place, third parties like bill collectors or private companies may be able to peek at your My Number information. Although the government claims the system is private and secure, no one knows what the future might hold. Identity Theft- Having so much sensitive digital info all in one place can make it a tempting target for those pretending to be you. Although state of the art security and measure like biometric IC cards might help prevent theft, cards can still be be stolen and data can be pinched by skilled hackers. For more information in Japanese and English, check out the outline set up by the Cabinet Secretariat. Also, if you know anything about this relatively new law then make sure to let us know in the comment section below. Does the My Number card have the name in Romanization and in the Japanese script which I use? Will I be able to keep the Juki Card which does have that information? Or does the My Number card replace the Juki Card, too.